Length: 22. "Item does not fit", "Just don't like it",etc. Through this technology, the effect will be multiplied and you will be able to see results even quicker. Sweat Shaping Vest with Osmotex Technology Lightweight. OSMOTIC PROPERTIES: Osmotex fuses sweating technology and osmotic technology in one single vest to allow you to sweat automatically. Chasor sweatshirt, platinum diamonds & champagne gold graphics. Top has intentional pilled/Distressed look. And is in great pre loved condition, super soft! ~ Off Shoulder Crop Sweatshirt, blue tie-dye, size large. Victoria's secret PINK. Climawear See The Light Runner Hoodie Size small. Seamless. Condition is New with tags. Shipped with USPS Priority Mail. Harley Davidson 1/4 Zip sweatshirt. XL 23” pit to pit 28” top to bottom. Made by Calvin Klein, this sweat shirt pullover is a great find! It has a hood with draw strings and a kangaroo pocket on front to keep your hands warm! IT has a slit on the side for a great look. Womens NIKE DRI-FIT Pull-Over Sweatshirt~Black~Size Medium~EUC! 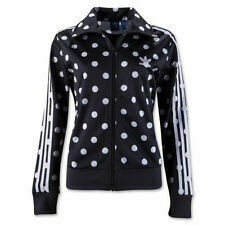 Sweatshirts and hoodies can be important elements of any woman's wardrobe. They can come in many colors, with graphics, or in one solid color. Women's sweatshirts and hoodies can keep you warm on a cold day, and they're also comfortable enough to wear indoors when you wish to feel relaxed. What should you know when purchasing women's hoodies or sweatshirts? Knowing your size and body shape will help you make the right purchase when going for a pullover, sweatshirt, or hoodie, especially the ones with long sleeves. You can have a rectangle, oval, pear, hourglass, or wedge body shape. Women with a rectangular shape should go for hoodies that have a fitting waist. Those with oval shapes should find sweatshirts or hoodies that flow from the shoulders downward. This style can give the wearer the illusion of having curves. Women with an hourglass shape should try a pullover hoodie that fits tightly, bringing out the body's natural curves. Also, long pullover sweatshirts could make one look curvier, especially if you have an hourglass shape. It's also important to know which hooded sweatshirts are made for men and which are made for women. 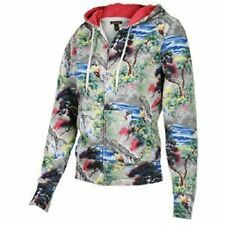 For instance, men’s sweatshirts and hoodies tend to have broader, longer sleeves and shoulders while women’s hoodies have brighter colors and are slimmer with shorter, sometimes cropped, sleeves. How do you find the right material? The material used to make women's sweatshirts should be smooth and feel soothing to touch when you put it on with or without other clothes underneath. Women's sweatshirts and hoodies with long sleeves are meant to keep you warm and comfortable. They are better suited for the cold weather or chilly nights. This means they should be made from a sturdy material such as cotton or fleece. However, they should not be too light such that they do not warm you up like heavier sweaters do, nor should they be too heavy and make you too warm. How do you get the right color? Bright colors and graphics go well with women’s accessories. The more colorful the hoodie is, the more relaxed you may look. A brightly colored hoodie can help lift your mood, but make sure you go for colors that complement your skin tone. If you have a very light complexion, go for darker colors. The contrast will make a fashionable statement. For instance, a hoodie or pullover made from white fleece material makes you look warm and bright on a cold day. What can you wear with women's sweatshirts and hoodies? There are many ways to accessorize the sweatshirts and hoodies. A handbag, a pair of tight-fitting jeans or shorts, or high heels can do the trick. Jewelry that complements the color and design of the hooded sweatshirt is a plus. If you prefer sweaters, trying a women’s hoodie will make a difference. You will be amazed at the change and how comfortable a hoodie feels. 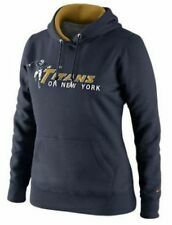 Women's hoodies and sweatshirts are comfortable and go with many types of clothing. If you do not like wearing long sleeves, go for short sleeves, with or without the pullover hoodie or its cropped version.